Back pain can be one of the most uncomfortable parts of getting older. It’s also a fact of life for people living with injuries and other spinal conditions. But even if you don’t suffer from any debilitating discomfort, you will benefit from from stretching the soft tissues – the muscles, ligaments and tendons – in your back, legs, buttock, and around the spine. Our spines are designed to endure continuous movement, and things like poor posture and lack of exercise can have negative effects on your spine’s health. Regular stretching, even for as little as 15 minutes every day, will help keep your spine healthy and prevent back pain in the future. Stretch on a clean, flat surface in an area where you have enough space to move freely. Always wear loose fitting, comfortable clothing that doesn’t restrict your movement. Stretching shouldn’t hurt. Don’t force your body into any positions that cause discomfort. Pace yourself by moving into the stretch slowly. Avoid ‘bouncing’ as this may actually tear muscles. 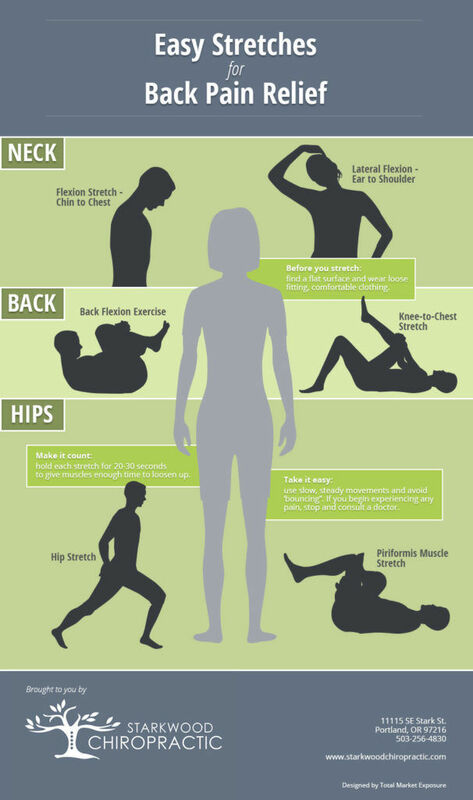 Repeat the stretches 5-10 times, working up to more repetitions gradually. If you already have back or neck pain, always consult a doctor before adding any new stretches to your exercise routine. This will prevent further injury. If you suffer from back pain first thing in the morning, these two stretches will help strengthen those muscles, ease tension and improve mobility. While lying on your back with your knees bent and both heels on the floor, place both your hands behind one knee and bring it to your chest. One of the side effects of a stiff back is a stiff neck, which can be very uncomfortable and a source of tension headaches. These stretches will help loosen up your neck and shoulder area. While standing or sitting, gently bend your head forward while bringing your chin toward your chest until a stretch is felt in the back of your neck. This exercise stretches the neck area below the ears as well as the top of the shoulder. To begin, gently bend your neck to one side as if to touch your ear to your shoulder until a stretch is felt in the side of your neck. Switch to stretch the other side. The hips and buttocks (where the gluteus muscles are) support the lower back, and stretching these muscle groups will help keep your spine flexible and combat lower back pain. While standing with your feet shoulder-width apart, take a half-step back with your right foot, bend your left knee and shift your weight back to your right hip. Keeping your right leg straight, bend forward more and reach down your right leg until you feel a stretch in your outer hip. The piriformis muscle runs through the buttock and can contribute to back pain or leg pain. To stretch the this muscle, lie on your back and cross one leg over the other and gently pull your other knee toward your chest until a stretch is felt in your buttock area.